Sept 8, 5pm. PAL for Graduate Students! Happy Hour! Interested in being in a PAL-sponsored Writing Group? Or just want to learn how to set up a group of your own? Come to this meeting with Jennifer Ahern-Dodson (TWP), Toril Moi (PAL) and Kristen Neuschel (TWP). Graduate students at all levels, from first years to dissertation writers, are welcome. Sept 25-26 Symposium on Action. Co-convened by Thomas Pfau and Vivasvan Soni. Oct 2, 6pm. 5:30pm Reception. Our new Intellectual Women series kicks off with an 18th century session: “The Making and Unmaking of Women’s Intellectual Reputations: Mme du Châtelet and Mary Wollstonecraft,” with Karen Detlefsen, Philosophy, University of Pennsylvania & Andrew Janiak, Philosophy, Duke; and Angela Maione, Hannah Arendt Center for Politics and Humanities, Bard College. Duke English graduate student Jacqueline Cowan will be a respondent. Dec 4. PAL Humanities Party! 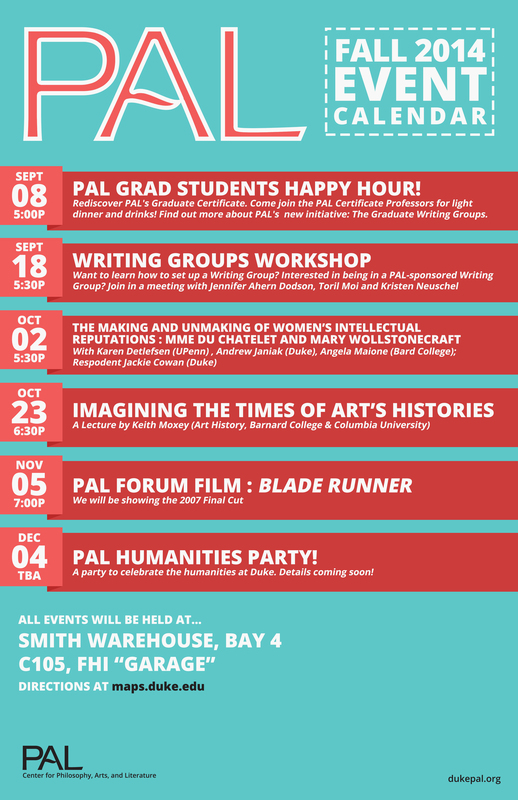 A party to celebrate the humanities at Duke: More details to come! This year we are delighted to introduce the new PAL/FHI Seminars on Concepts, Figures, and Art Forms: (1) The Contemporary Novel; (2) Whose Kafka? Feb 26-27: The 3rd biennual PAL Writing Is Thinking event with Verlyn Klinkenborg, formerly of the editorial board of The New York Times, long-time teacher of non-fiction writing at Bard and Yale, and author of Several Short Sentences About Writing (Knopf, 2012).